Christ Jesus - All Sufficient, Always, in All Things to All People Everywhere! God Loves You... and so do we. It's true. We love you, because Jesus loves us. We have all the normal human emotions, and we're not perfect. No one is. We try our best to follow the example set by God's only Son, Jesus Christ. Please use the materials available on this site to help your walk with God. And please, let us know if there's anything we can do to help. ChristLife offers a variety of Christian resources (books, pamphlet messages, and more) as a vital part of its ministry. We do not charge for our electronic materials, these are freely available to download. To order printed materials, we suggest, a minimum donation remittance. If someone is unable to afford the donation amount, we will try and fill the request without charge. The quantity we can send freely is, of course, limited. WE SERVE AND PROVIDE AS GOD GUIDES AND ENABLES. Make sure you download your free Christian books and literature. You may use the links on the left to navigate our site. This ministry seeks to serve all the people of God, using as its sole authority, the written Word of God as revealed by the Spirit of God. We desire to strengthen the saints in Jesus Christ and reach the lost for Jesus Christ! 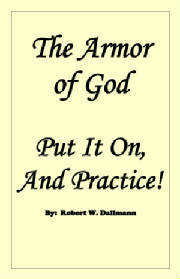 The Armor of God - Put It On, And Practice! Click on this photo for more details. The "Armor of God" is a well studied subject, with no shortage of resources available. Our prayer is that this book can help us to look at this subject in a new or different light. For example, many times PRAYER is not taught as a part of the armor, but the topic of prayer is essential to the immediate context of the "Armor of God". TWICE, the Apostle Paul asks for PRAYER to speak BOLDLY as he should. Order your copies today! Click on one of the PayPal buttons below. Books may be obtained for a small donation. Now Available on Amazon! If you prefer an e-book version, you can now find this book on Amazon.